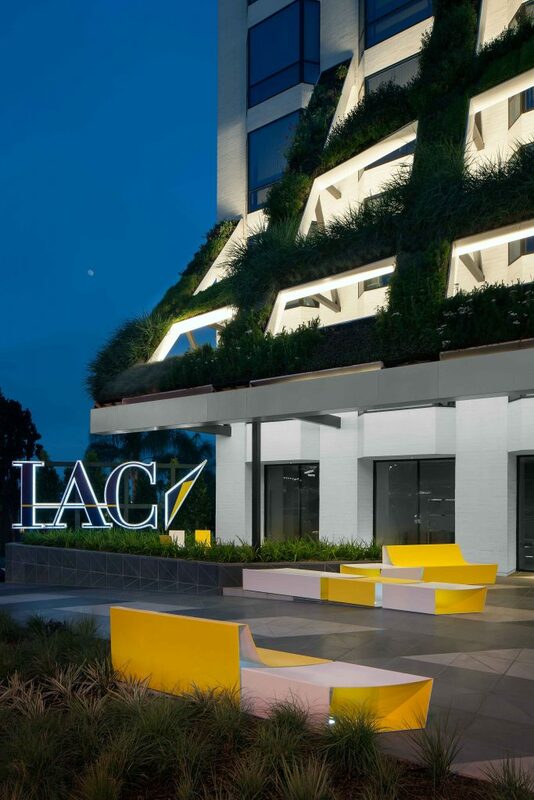 When prominent internet media company IAC first approached Rios Clementi Hale Studios about this project on at a significant intersection at Santa Monica Blvd in the heart of the Sunset Strip, the existing office building stood as a reminder of 1980s architecture, neglected for its unoriginality. 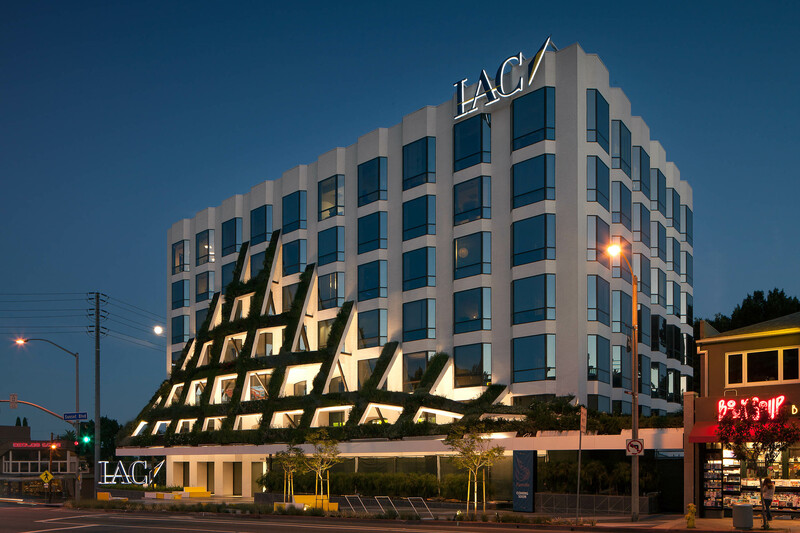 The new design solution left the original building intact, transforming the exterior dark brick façade with white paint and a dramatic 70-foot wide green canopy façade. 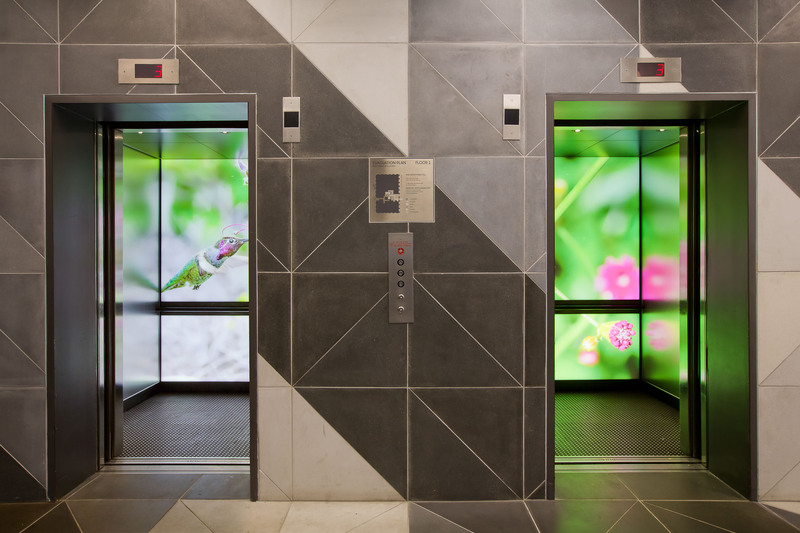 The concept of the “green screen” made the exterior spaces experiential by extending the occupiable perimeter and increasing the building’s prominence at this busy urban intersection. 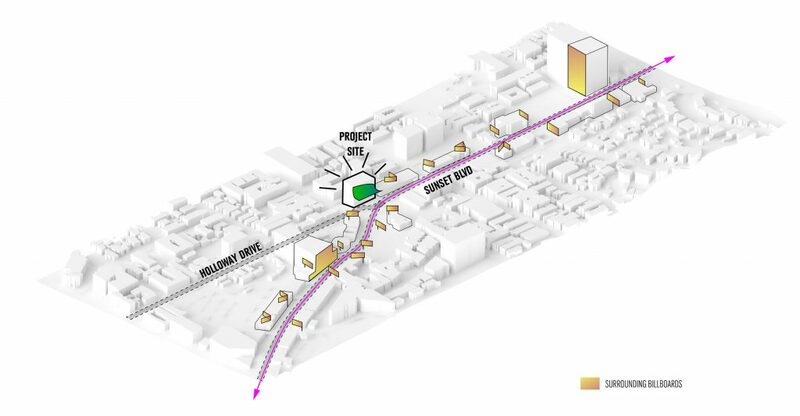 The resulting design defines the larger urban context defining both the building and the intersection with a civic gesture that extends into the public right away. 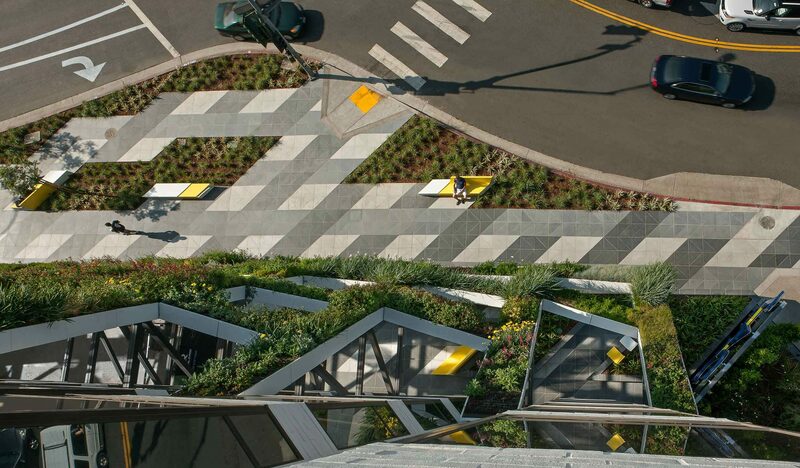 The shape of the canopy and the arrangement of the California-native plants that bring the canopy to life both evoke the nearby Santa Monica Mountains. 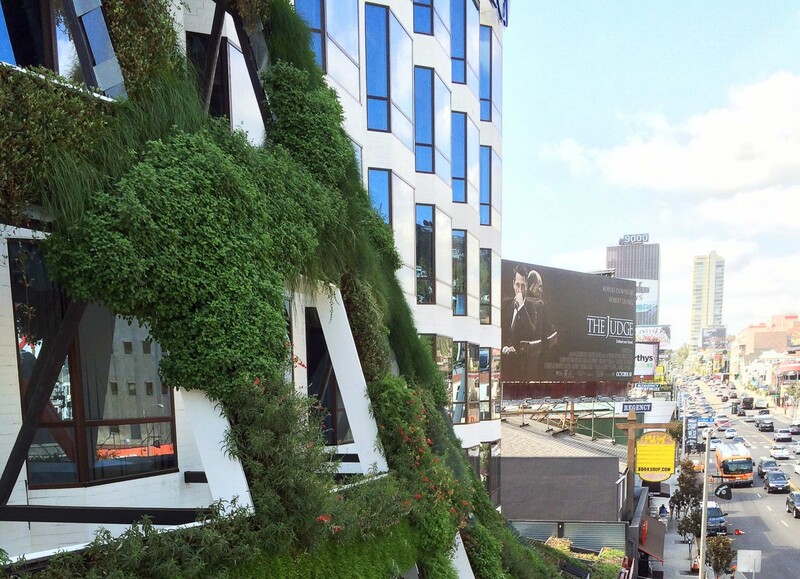 The living wall 12’ off the sidewalk literally carries the surrounding landscape up the side of the building over 3000 square feet of structure. 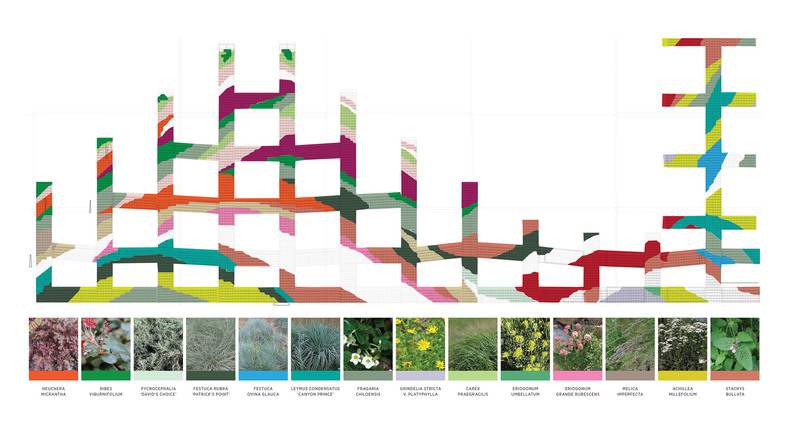 The planting pattern was considered extensively, altering in cadence in response to areas of least sun to most sun and also from driest to wettest, as the water moves down the green façade to the lowest point of the armature. 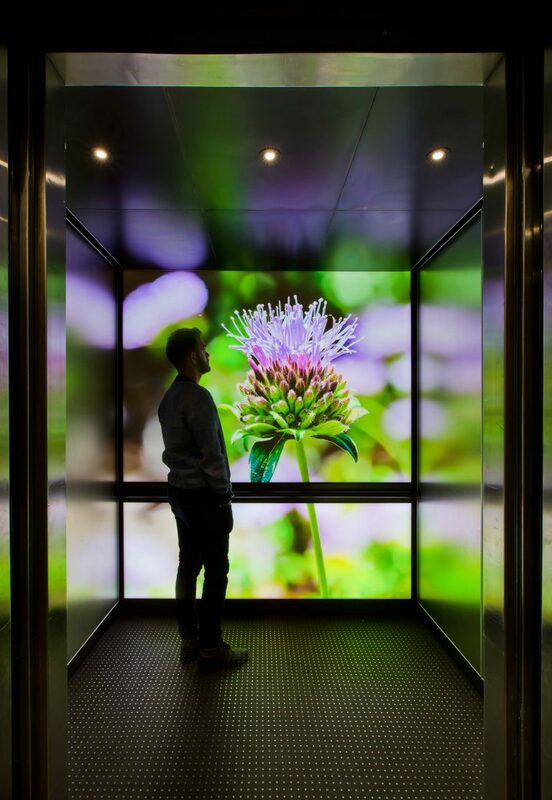 The plant species are appropriate to each microclimate, creating dynamic urban ecology in the form of both sculpture and function. 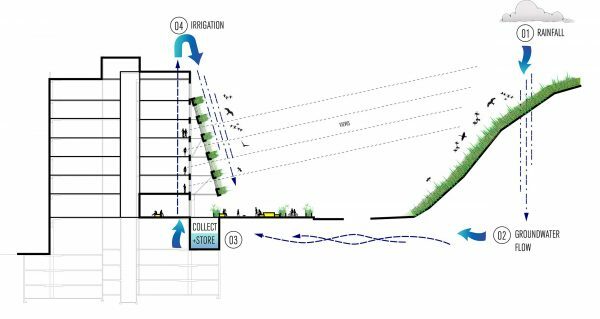 An innovative irrigation system captures and repurposes nearly 7,000 gallons of naturally occurring groundwater that previously had to be pumped out of the garage every month. 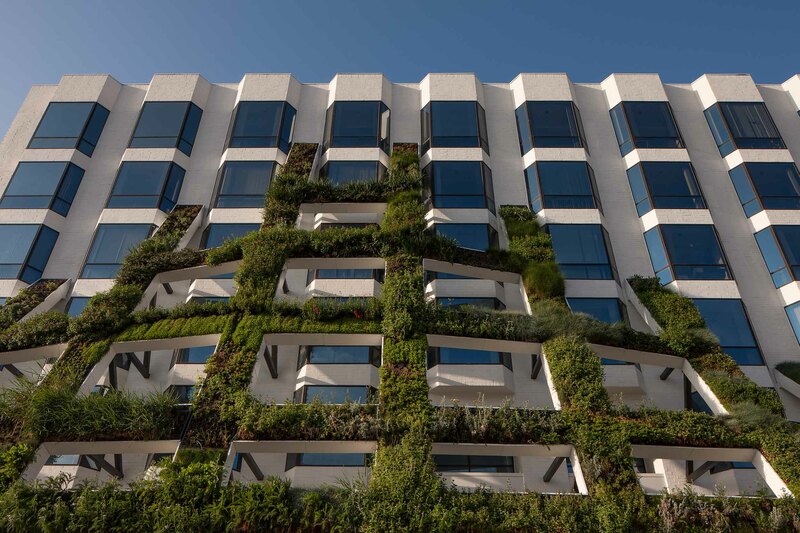 The planted structure allows light to pass into the office building, while demarcating an entry experience and creating natural canopy for a new outdoor patio adjoining the lobby and ground-floor restaurant. 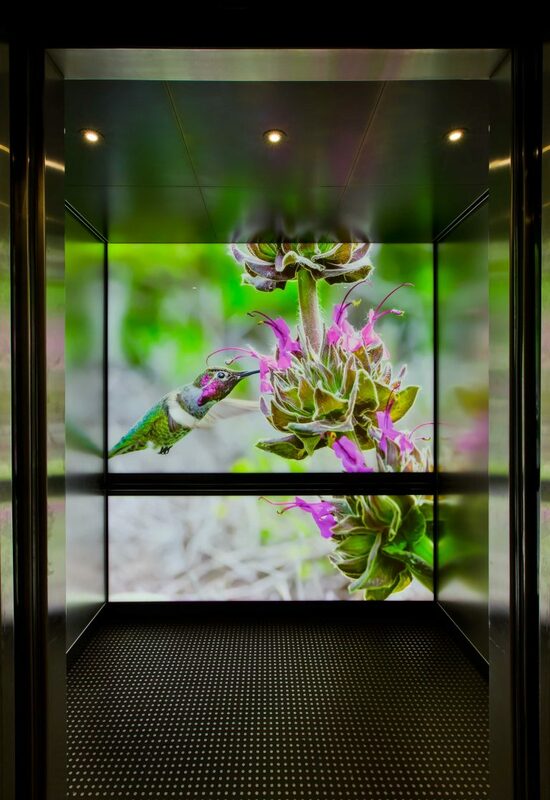 “Standing on the Sunset Strip with the hum of traffic, it is a surreal and magical moment to witness a hummingbird spontaneously appear and vigorously feed off a native sage plant suspended 40 feet above the ground off the face of a building. 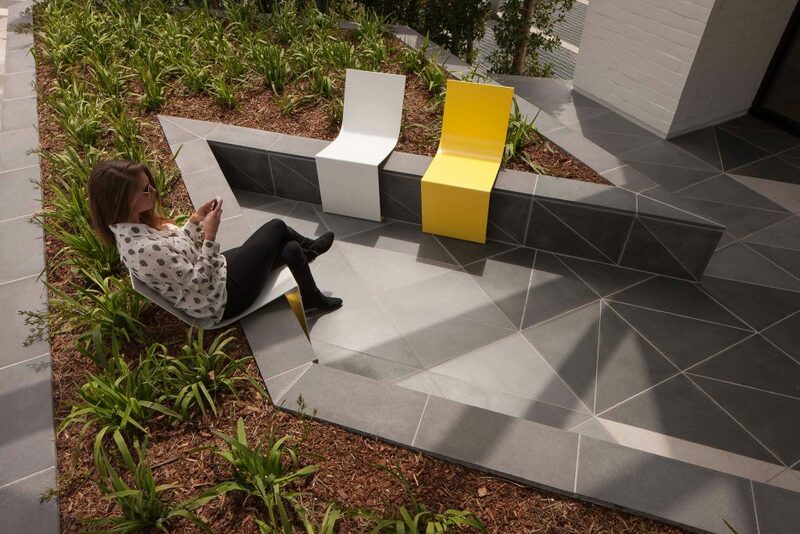 A redesign of the city sidewalks creates an urban plaza inspired by patterns of passing pedestrian traffic translated into a diagonal pattern of pavers — reflective of the lattice openings — that moves from the exterior plaza to the interior lobby spaces, weaving an urban tapestry where public life momentarily intersperses with private enterprise. 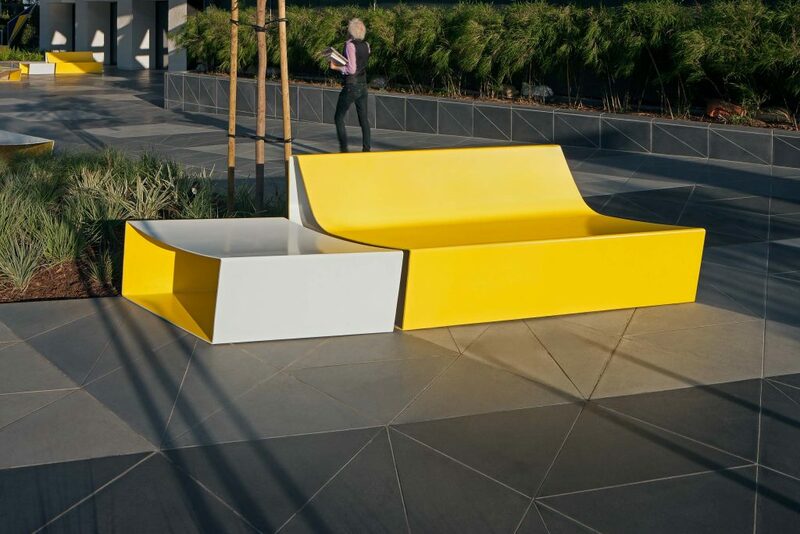 Custom-designed street furniture — at once both visually light and physically durable — is inspired by the geometry of the plaza and makes the plaza a “people place” that encourages lingering in this generous urban gesture. 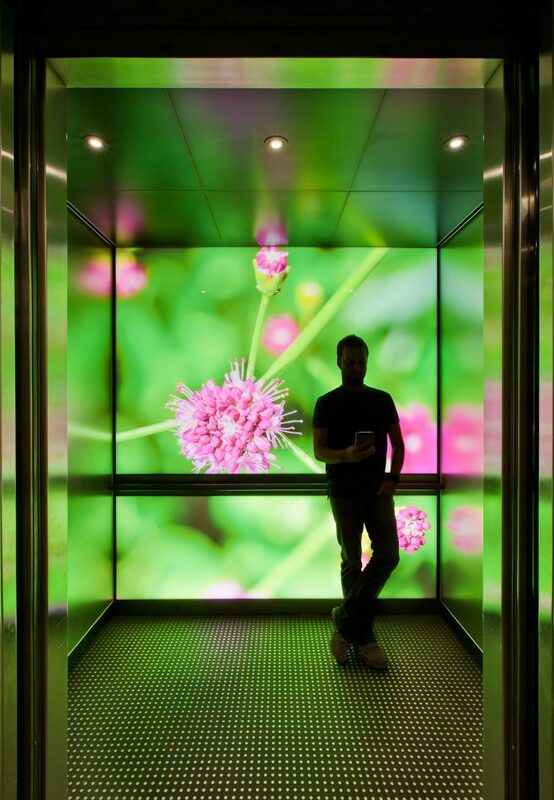 figuratively allowing you to occupy the ecology as you rise up inside the building.